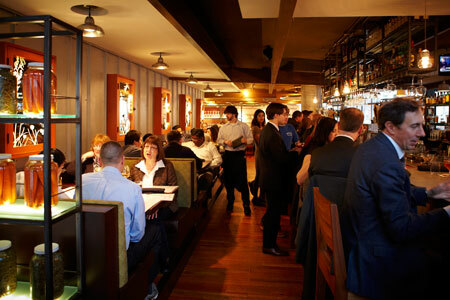 A farm-to-table restaurant with high-class, all-American fare. : Strategically located for highest visual interest on the first floor of the IMF building, Founding Farmers appeals to all those craving home-spun food with a high-gloss spin. In a modern steel, glass and wood setting, FF operates on the premise that local and sustainable are more than just stock phrases that are now part of mainstream American conversation. Indeed, its ingredients --- from vegetables to pork and all that comes in between --- come directly from American family farmers. The restaurant’s design is “green” as well, incorporating reclaimed and recycled materials and using energy efficient plumbing and electricity. But apart from that, the chef indulges patrons with contemporary American cooking that includes such old-fashioned-yet-new appetizers as deviled eggs with lobster, crab and smoked salmon. The remainder of the menu tackles other favorites with a contemporary twist, like the chef’s riff on chicken potpie and meatloaf. The Farmers Salad features baby lettuce, avocado, dates, tomatoes, red grapes, almonds, Parmesan and house-made Champagne vinaigrette. To keep pace with its upscale approach to American food, FF also offers a selection of vegan dishes. Beers and wine get special attention with everything from American microbrews to European selections. And teetotalers are not forgotten, as there’s a full range of house-made sodas, teas, coffees and freshly squeezed fruit juices.